New Zealand targets to double its exports to the Philippines by 2025 in an effort to cement economic ties between the two nations. “My target is to double New Zealand exports to the Philippines by 2025. So, from NZ$750 million [in exports last year] to NZ$1.5 billion by 2025, that will be my target,” New Zealand Trade Commissioner Hernando Banal II told reporters in a briefing Tuesday. Wellington aims to grow the share of exports in gross domestic product to 40 percent by 2025 from 20 percent. 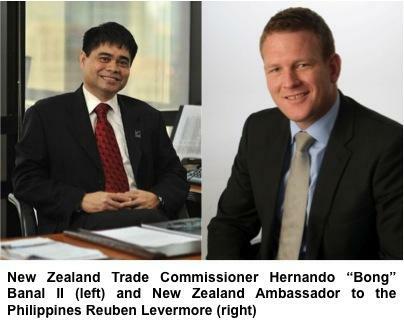 “The Philippines is a very important market for New Zealand,” Banal said. Wellington also wants to grow revenues from other goods such as technology niche products, New Zealand Ambassador to the Philippines Reuben Levermore said in the same briefing. Last year, the Philippines was New Zealand’s 12th biggest export market, with food and beverage products accounting for the bulk of shipments. Apart from trade, more companies from New Zealand turn to Asia for investments, and the Philippines is becoming a more attractive place to do business in, Levermore said. “New Zealand companies are turning more and more toward Asia and the Philippines is getting on their radar screen in a way that was not the case 10 or 20 years ago. It is happening because the economy is growing and you hear good stories about the government to try and improve the business environment, to eradicate corruption,” he said. “The more companies that come and set-up office here, the more that have positive experiences, the more I think companies are going to come,” he added. Opportunities are seen in engineering, information communications technology and specialized manufacturing, Banal noted. Last month, a delegation of 12 companies led by New Zealand’s Trade Minister Tim Groser visited the Philippines to check out business opportunities. The trip yielded new agreements in technical and consulting services in geothermal energy, information technology and healthcare systems. Wellington also sees a lot of potential in growing tourist traffic between the two countries, which was pegged at 25,000 last year. “We would like to see more Filipinos go to New Zealand for holiday. One of the things that will help that is as we improve the number of connections to our countries,” Levermore said.